Debbie Schmidt from IDS Group. Debbie is the Senior Vice President of Sales and Marketing. Shane Trigg from Salesforce. Share is the Senior Vice President of Marketing Cloud. Pat Loridas from Optum. Pat is the National Vice President for the Employer Market. John Thackston from SOAR Performance Group. John is the Vice President of Client Engagements. John will share insights as well as moderate the discussion. The event starts at 5:00pm with refreshments and networking. The panel discussion will begin at 5:45pm and conclude by 7:00pm (including time for questions from the audience). Attendees can expand their professional network by meeting sales leaders from top companies at this event. Past events have included sales leaders from CH Robinson, HP Enterprise, IRI, LinkedIn, MicroFocus, Miller Coors, Patterson Medical, SAP, Shearer’s Foods, Siemens Healthineers, Softchoice, Southwire, Whirlpool, and Zones. The meeting is open to practitioner sales leaders and invited guests. There is no cost to attend. Registration before the meeting is required to ensure that a seat is available. For more information and the links to register, go here. 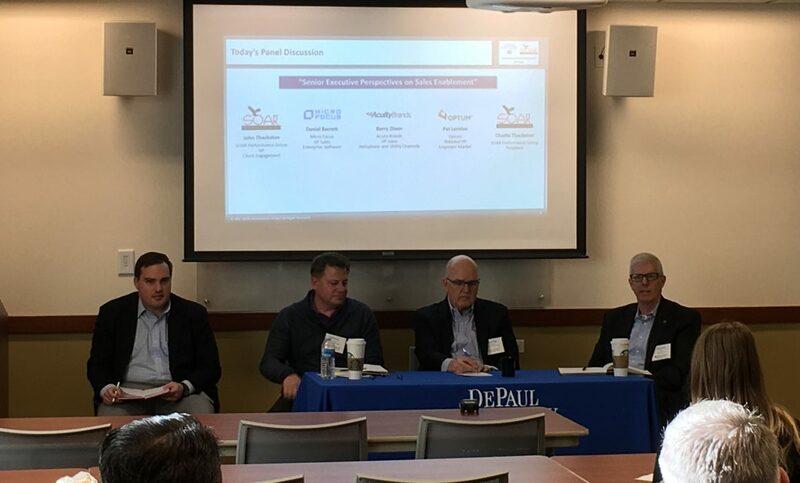 The Chicago Sales Leadership Community was co-founded by DePaul University and SOAR Performance Group. 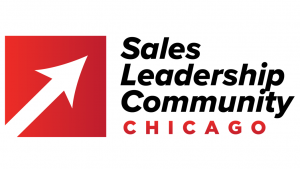 The Chicago Sales Leadership Community is a cross industry organization of senior sales leaders focused on building a community within the Chicago market for advancing best practices in sales leadership. 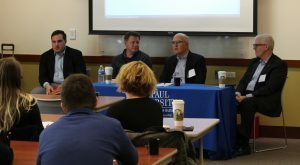 It also creates networking and mentoring opportunities for sales executives with DePaul University students participating in the DePaul University Sales Program. For more information about the Chicago Sales Leadership Community, go here. DePaul University, the largest Catholic university in the United States, offers academically excellent, flexible, practical programs of study in a student-focused learning environment. The Center for Sales Leadership is a program within the Driehaus College of Business. The Center for Sales Leadership’s mission is to educate and mentor students to prepare them for careers post-graduation. The Center for Sales Leadership has one of the largest sales curriculums in the country. The Center for Sales Leadership is located at 1 E. Jackson, Chicago, IL 60604. For more information about DePaul University’s Center for Sales Leadership, go here. SOAR Performance Group is a client-focused sales consulting and training company that concentrates on sales performance improvement. We accelerate results for our clients through the development and execution of new sales and go to market strategies. Clients achieve success through a process of insights, diagnostics, consulting and training centered on a comprehensive understanding and connection to each client’s business. For more information about SOAR Performance Group, go here.